Free download VirtualDJ latest version from direct download link. Virtual DJ is a music mixing PC desktop software, which allows you to set the music according to your desire. It is the best solution for beginners because of its easy use. It is very good DJ set up for professional too. It is developed by Atomix Productions. Virtual DJ is very easy to use, just drag the sound record from the desired location then set the sound levels, you have an option ‘Auto Mix’, if you don’t know how to do the transitions. You only need to press this button. After all this done, you’ll have a pretty good mixed version of song. You’ll enjoy a lot, I can bet it. 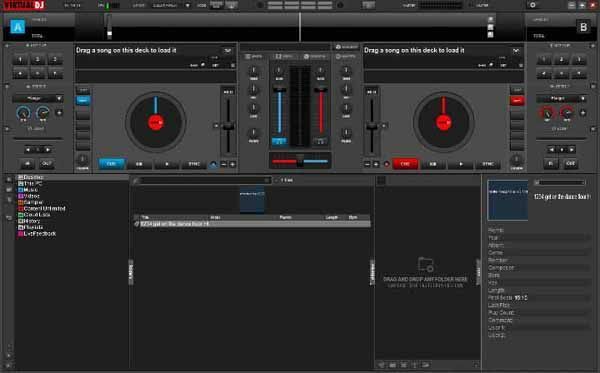 Virtual DJ has a lot of features like; it has BPM counter which helps you to analyze and manage the sound tracks with transitions, it has the option of sample and loop the tracks, you can add different effects, there is also a good feature named ‘Scratch Mode’ and many more. Let’s talk about the quality of mixing with Virtual DJ. You can record your mixed music through which you’ll learn a lot like you can see your mistakes and correct them. The recordings can be in MP3 format too which can be burned on CD or DVD and can be shared with your friends. It supports up to two sound cards and its quality is very good, its users describe its quality is the best which you’ll feel when you use it. Last but not the least; the Virtual DJ also supports to mix the HD videos in DVD, DivX, MPEG and all that formats. You can mix the videos and after that you can see them on TV screens, Projectors, LCD and monitors, which is a unique feature.